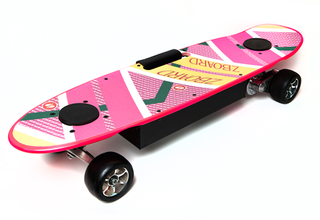 A true hoverboard is still in the works, but in the meantime, Zboard, makers of the outstanding electric skateboard, have released a special Back To The Future edition. It has a built-in electric motor with a top speed of 17 mph, and io9 readers can get one for $149 off. How does an electric skateboard work? You just tilt forward to go faster, lean back to brake, and lean sideways to enjoy steering your ride. There's enough battery capacity under the deck to keep you moving for up to 5 miles per charge. It's also equipped with rubber wheels for secure grip, and a carrying handle for when you reach your destination.